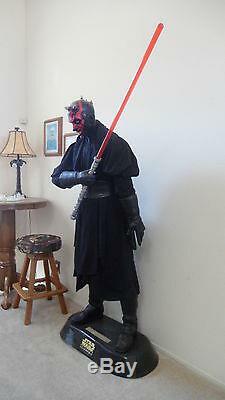 Star Wars Life Size Darth Maul 1999 Frito lay Pepsico Promotion. This was a PEPSI/FRITO LAY GIVEAWAY display statue back in 1999. I have the other end of the light saber, it is just not included in the picture. May be able to save if closer to San Diego. Please inquire for exact amount. ALL AMERICAN COLLECTABLE IS ACCEPTING CONSIGNMENTS! 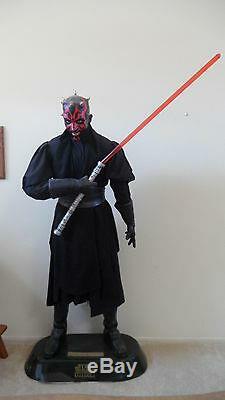 The item "Star Wars Lifesize DARTH MAUL Statue with Full Light Saber" is in sale since Sunday, December 9, 2018. 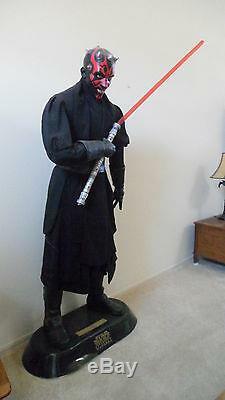 This item is in the category "Collectibles\Science Fiction & Horror\Star Wars\III\Revenge of the Sith". The seller is "aastamps" and is located in San Diego, California. This item can be shipped to United States, Canada, United Kingdom, Denmark, Romania, Slovakia, Bulgaria, Czech republic, Finland, Hungary, Latvia, Lithuania, Malta, Estonia, Australia, Greece, Portugal, Cyprus, Slovenia, Japan, China, Sweden, South Korea, Indonesia, Taiwan, South africa, Thailand, Belgium, France, Hong Kong, Ireland, Netherlands, Poland, Spain, Italy, Germany, Austria, Bahamas, Israel, Mexico, New Zealand, Singapore, Switzerland, Norway, Saudi arabia, Ukraine, United arab emirates, Qatar, Kuwait, Bahrain, Croatia, Malaysia, Brazil, Colombia, Panama, Jamaica, Barbados, Bangladesh, Bermuda, Brunei darussalam, Bolivia, Ecuador, Egypt, French guiana, Guernsey, Gibraltar, Guadeloupe, Iceland, Jersey, Jordan, Cambodia, Cayman islands, Liechtenstein, Sri lanka, Luxembourg, Monaco, Macao, Martinique, Maldives, Nicaragua, Oman, Peru, Pakistan, Paraguay, Reunion, Viet nam, Uruguay.